Reduce your inventories with an efficient material supply system. A well-structured and clearly organized material supply system generates transparency to help you reduce your stocks. Various conveyor tracks employing various conveyor media are able to transport all containers and weight classes safely and reliably. Simple conversion, attachment and expansion options serve to future-proof your system. 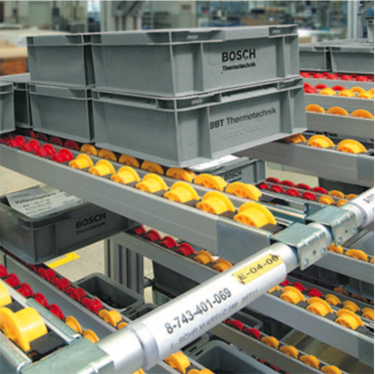 Ingenious details such as color-coded rollers for long-range inventory visualization (kanban). The application of the FiFo principle reliably ensures that materials are used in the prescribed sequence. XLean is the price-conscious alternative. The Lean system gives you the benefits of high flexibility and numerous combination options – colored rollers to code your stock or to help distinguish between good and reject parts. Slide rails are available as the conveyor medium for certain applications, such as when you have a steeper gradient. For heavy loads or for moving blister packs or cardboard boxes, EcoFlow is your best choice. The easiest way to order is to freely configure your flow rack system with your required dimensions and equipment. If you need even more flexibility, you can custom assemble your flow rack system from rack modules and individual components. All parts are designed to combine, so you can use the MTpro Layout Designer to put together your system any way you like. The flow rack system and components are available in ESD-conductive design suited for use in electrostatic protected area (EPAs). In designing your flow rack system it is essential to know which materials will be supplied in what quantity and in which containers. The number of parts and containers, their type, their dimensions and their weight all need to be taken into account.